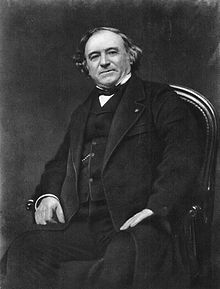 Jean-Baptiste-Andre Dumas was born on July 14 (Bastille Day), 1800 in Ales, France. His father worked as a clerk in the municipality of Ales. Initially his family prepared him for a naval career, but with the bloodshed that followed the downfall of the Napoleonic empire he was apprenticed to an apothecary. Wishing to leave his home in 1816 he traveled to Geneva on foot, where he attended lectures on science. The apothecary where he worked provided a laboratory where he could perform experiments. In 1821 Dumas went to Paris where he completed his studies in chemistry. Two years later Dumas was appointed lecture assistant to Louis Jacques Thenard, a professor at the Ecole Polytechnique. Dumas succeeded him two years later. During the 1820s Dumas developed a method of measuring the vapor densities of volatile liquids which he used to measure the atomic weights of 30 of the 59 the elements known at the time. Starting with the hypothesis of William Prout, that the atomic mass of hydrogen was 1 and all the other elements were multiples of hydrogen's mass, Dumas determined the masses of the other elements. Later Dumas began work on organic chemistry (chemistry involving compounds of carbon) going on to become one of the most advanced organic chemists of his time. In 1833 Dumas developed a method for determining the amount of nitrogen in an organic compound, founding modern analytical chemistry. Dumas also studied physiological questions. In one of his first researches he determined that iodine was what was necessary factor to treat goiter. He also determined that kidneys removed urea, a form of nitrogen waste, from the blood. When he reached middle age Dumas devoted more of his time to public service and less time to scientific research. He served as the minister of agriculture and commerce and as director of the mint. He was also served as a senator. Dumas died on April 10, 1884 in Cannes. He was buried in Paris and his is one of the 72 names memorialized on the Eiffel Tower. Cooke, Josiah Parsons; "Jean-Baptiste-Andre Dumas"